Del Mar, California is an amazing place. I can’t thank the Village of Del Mar enough for inviting me as their guest. The moment I drove into the village and felt the cool breeze on my skin… I felt at home. Del Mar has such a sense of community. Families are playing at the park and community center. Couples are holding hands and walking down the beach. Joggers and bikers are enjoying the paths. One of my favorite experiences in Del Mar was simply engaging with the local shop owners. They take pride in their town and their business. They’re friendly and full of such great information for the visitors. Oh and… visitors aren’t made to feel like visitors. I felt like I was a townie. Like I really belonged there. A regular at Bully’s neighborhood bar, grabbing a quick beer among friends. Loved that. The purpose of my visit was to experience the many wellness activities that Del Mar has to offer. I’ll start with my hotel. I stayed at the Clarion Del Mar Inn by Choice Hotels. It was a quaint, boutique style hotel and it’s been newly renovated. You’ll see in the pictures below, that my room was amazing. The ocean view was breathtaking and there was a great little balcony patio. Also… the room has a compact, yet functional kitchenette. This was great for leftovers and for keeping my snacks cool. 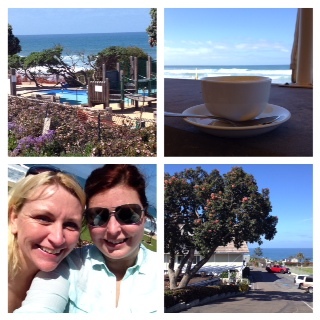 Speaking of snacks… the Clarion Del Mar Inn has a cute little Bistro with an outdoor fireplace and view of the ocean. My favorite part of the stay was relaxing by the pool and in the spa. The pool and spa area are surrounded by gorgeous, lush gardens. It was the perfect place to unwind after a day of exploring the beaches and village. The staff went above and beyond to make sure that my stay was a pleasant one. And it wasn’t just for me… I observed the staff treat every guest with just as much care. The Village of Del Mar offers so many wonderful wellness activities. From salon experiences, to yoga classes and massage packages. From decadent food and wine to a run on the beach… you’re sure to find the perfect activity to heal your body and spirit. I was so pleased to be able to make my way through Del Mar and create a little package of my own. Let’s talk food. Jake’s is a fantastic restaurant right on the beach. At Jake’s… I really indulged. My friend, Fiona, came down from LA and we had a great time! It started with a lovely wine. A red blend called Prisoner. Along with that… a delightful cheese board with meats and breads. Finally… a delicious Kobe burger. Jake’s has delicious food, friendly staff, and a gorgeous view! We watched the sun set right from our table and everyone cheered as the last flash of light went below the horizon. What fun! Moving on that evening… we stopped at what may have been my favorite place in Del Mar. Cafe Secret is a charming little restaurant in the village. We asked our server what his favorite drink was and he served us the most delicious sangria! Really! Then we had some dessert. I cannot emphasize enough how delicious the 4 Leches Cake is at Cafe Secret! Cold, creamy, sweet… decadent! I wanted it again… but they were closed on Monday. Actually… I wanted to bring that point up. Many places are closed on Monday in the village of Del Mar. Make sure you plan your stops accordingly! More food… We had a delicious coffee on the beach at Poseidon and happy hour drinks and snacks at Pacifica Del Mar. They have happy hour deals every night in the bar area! Finally… Bully’s is the friendly neighborhood dive bar. Don’t miss it! They actually have a great dessert menu too! Wellness. There are so many things I could say about wellness in Del Mar. I chose to have an hour long reflexology massage at De La Sole. They’re fantastic! Walking in… it’s such a relaxing atmosphere. There’s a tea service table, calming music, and a soothing fountain. My Reflexologist was so knowledgeable and kind. She explained exactly what she was working on and why. I could’ve chosen to have it quiet during my session… but I enjoyed asking questions. After my curiosity was satisfied… I did get quiet and relax. It was an amazing experience. I felt so energized after I left the session! I highly recommend checking out De La Sole. They even have a first time client, walk in special. Ask about it! In addition to my reflexology massage… I enjoyed a long walk along the beach. The waves are so soothing. There was also plenty of activity happening around me. There were runners, beach yoga, surfing, and out in the distance… paddle boarding. I’d really like to try paddle boarding next time I’m in Del Mar. And now… I’ll bet you’re ready to plan your own trip to Del Mar! Whether it’s a family friendly trip, a girls getaway, or a wellness retreat… you’re sure to find it all in Del Mar.For more inspiration… check out their Pinterest boards. Here’s a special promo code, just for you, my friends! 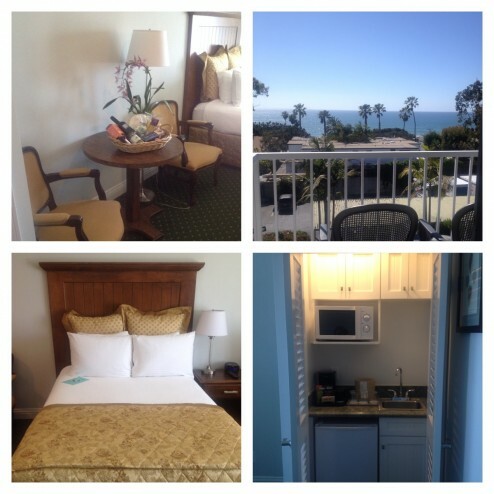 Call The Clarion Del Mar Inn directly at (858) 755-9765. Tell them that you have a special promocode: DREAMDELMAR This code gives you 25% off your room rate through May 31, 2014. I’d love to hear what you would most like to try while in Del Mar. Leave me a little note! Note: As disclosed in the first paragraph of my post… I was guest of the village of Del Mar. I was compensated for my travel and received a 2 night stay. All of my activities were on my own. 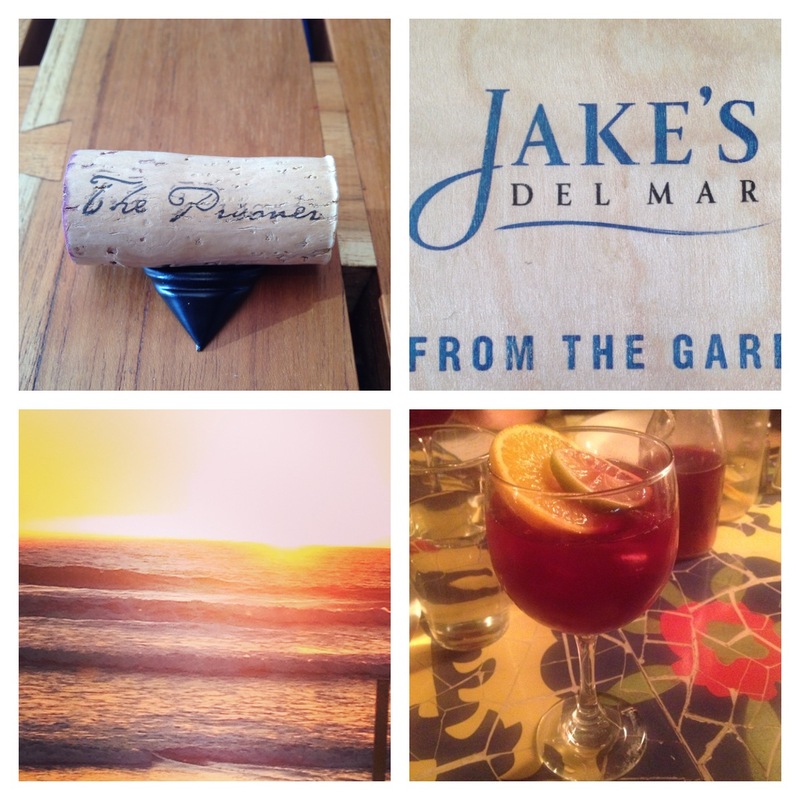 I loved every minute of my stay in Del Mar and I can’t wait to go back!